Creating this fused plate jump started me on my glass journey! I love Dragonflys! Their ability to see 360*, fly hover, and dart at amazing speeds, along with their ancient lineage fascinates me (they go back to the age of the dinosaurs!). 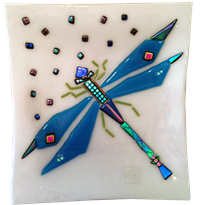 This fused dragonfly square plate is one of the first things that I ever designed and created in glass. When I got it back from my instructor, I was so proud and delighted with the color choices and overall shape. She tack fused it and then slumped it, so it remains very dimensional in all senses of the word!